We started out with the hopes of creating a place that we’d like to drop in to, have a great glass, see friends from the business and pickup an interesting bottle or two. Since then, we’ve grown to over 4,000 square feet of lounge, tasting space, private dining, outdoor cigar patio and wine retail. A good friend of ours, who also happens to be a great Winemaker likes to say “this is the place people in the know like to go”, and we’re proud to be that place we could only have imagined a few years back. We invite you to join us in the discovery of great wines, big and small, sound advice and great times. Our guests like to tell us that coming to V is like visiting your best friend’s house, but with better wines. So come in, put your feet up and enjoy Napa Valley’s very own living room. Good hosting is crucial to an enjoyable wine tasting and purchasing. 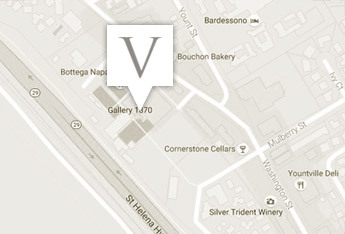 Our experienced and attentive team will do all they can to ensure you have the best possible time at V Wine Cellar. Come by relax unwind and enjoy some of the finest Napa has to offer. A veteran in the Yountville food and wine seen with over 10 years of experience in listening to clients and making memorable wine recommendations here at V Wine Cellar. An original regular of the shop every payday gaining exposure to old world wines led to the perfect platform for a passion for life that is fueled by food, wine and entertainment. " Carlos has worked his way to the position of General Manager, which he has held since 2012. Earning your trust and continued patronage is my goal, enhancing your exposure to great wines is my pleasure". Carlos ~ specializing in earning your continued business with solid recommendations and client services ! Larry aka "Shup" is a longtime Hospitality professional spanning six decades having worked in some great hotels around North America and Partner in V Wine Cellar. Larry has an infinite love for old California Wines and has been a prominent expert in various wine competition's throughout north america. If he is at the store make sure to have a glass of wine with him and let him tell you stories of Napa Valley back in the 70's & 80's. For the past ten years, Lewis has been the partner and manager of the highly successful V Wine Cellar, a fine well known wine boutique cellar/wine bar located on the 23-acre Vintage Estate in Yountville, California. Scott spent his earlier years working in some of the top hotels in the world in food and beverage management found Napa and never left . An Irish man turned rouge on wine his special powers are anything Pinot and California Cabernet.